Today, I think there's going to be mostly pictures in my post. That's probably very welcome for those of you who don't like reading long texts :) Today I think I'm going to tell you about the very "french" things I've seen/experienced. 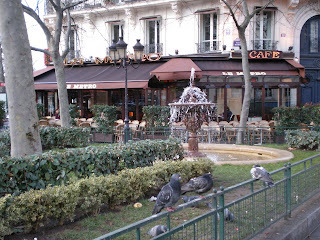 Here's, on the other hand, a view that's very french: pigeons, a fountain and a café :) This is taken quite close to Notre Dame. 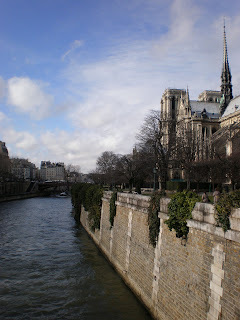 And as you can see, this picture is even closer to Notre Dame. I just thought it looked nice once the sun for once came out of the clouds. It was actually quite warm today, around 10 degrees, I think... Maybe the spring will arrive here after all! 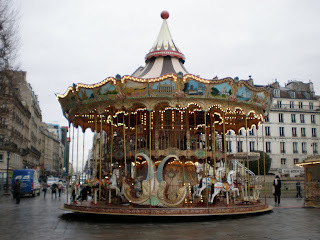 And oh, I just thought this carousel was so lovely! I would have gone for a ride if it had been warmer! 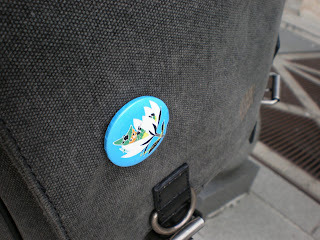 And ok, it cost 2,50€ so it'll better be a very long ride to be worth that price! Guess what? 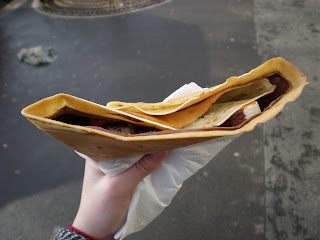 I and Sophie ate Crèpes today! Mine was filled with banana and nutella and oh it was delicious! If you come to Paris, you should try it! There's many different flavours and they're not even that expensive. Another very french thing appears to be strikes. When Sophie arrived in Paris a few days before me, the busses were on a strike so she had to grab a taxi to the city. Luckily she found someone to share the taxi with, otherwise it would have cost her 60€... And now it seems the next strike is coming along, this time it's the teachers at the university! Our lessons SHOULD start next week, but nobody knows. They might as well start the week after that. We'll see what happens. Oh! 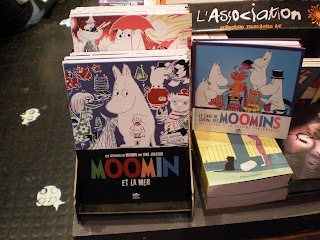 And in the afternoon me and Sophie walked into a shop with comicstrips and look what we found there! !